How computers work: How hard disc works? The area of data storage is a set of flat plates coated with magnetized lining.Data is stored as a series of coordinated magnetized area inside lining, called "domains". To read the data or write, a device called an executive device moves heads to read or write to position, vertical compared to the disk, while the plates spinning at high speed. Then, the signals are sent to the head, or the head receives signal, which records or reads data. 1.FAT - in one part of the disc, in space to store files, information about the location of all files on the disk are stored. 4.Data cable - Trough this cable data flow between the hard disk, and devices that we call the "Master Disc". This device manages plates spins and data flow between the heads, "read-write" and the opposite of it and the executive devices. 5.Block devices executive - executive device receives a continuous flow of instructions to run the "read-write" heads.It can start running heads up to 50 times per second. 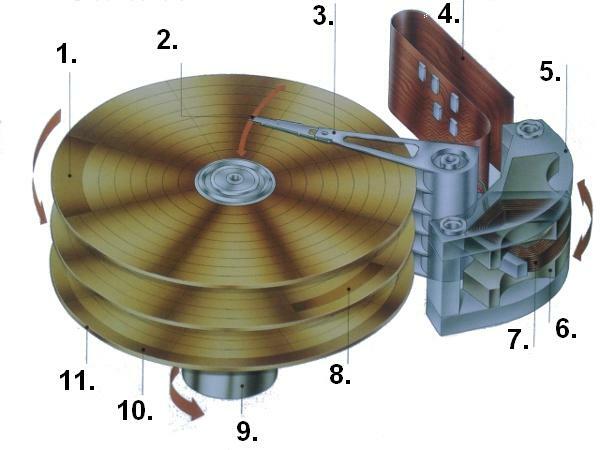 7.Movable coil - coil turns inside of the permanent magnet in the center of the executive device. When an electrical impulse reaches the coil, causes her turn, and this in return causes shift of the lever of executive device. 10.Track - Before first use, magnetized coating on each panel shares on the concentric tracks using special signal from the computer, a process called formatting. 11.A set of plates - information is stored on both of their sides. Read-write Head - Once the head is correctly positioned, the magnet on top of her sends electrical pulses to ensure that the data will be written into proper sector.Binar data (0 and 1), encoded by electric current direction change, turnin into harmonized patterns in the "domains". The data from the disc is read the reversing the procedure, ie the passage of "domain" below the electromagnet, which induces a current in the wire. 1.Electromagnet - When data is written to disk, electrical impulses arriving there, produce magnetic fields that align "domains" on the track below. 2.Wire - this wire transfer written or read data registered between "read-write" head and the supervisory mechanism of the disk. 3. "Domains" with data - Each domain is arranged in one of two possible directions. Changing direction in relation to the previous position of "domains" means 1, and when there is no change means zero. 4.Freely ordered "domains" - Where on the disc were never even written data, "domains" are freely ordered.